Salzburg is a breathtakingly beautiful city that seems to exist mainly to ensure the immortality of one man: the child prodigy composer Wolfgang Amadeus Mozart. There are Mozart cafés, Mozart restaurants and Mozart museums – and even tourist gift shops where you can buy Mozart rubber ducks and flying birds with Mozart’s face, all wearing powdered wigs. There is a spectacular concert hall where the programme includes the work of many composers, foremost among whom is – Mozart. There are Mozart chocolates, made by two rival companies: the original chocolatiers, whose business is very small and still confined mainly to the Salzburg region, and a younger, upstart firm whose aggressive marketing has been so successful that its distinctive round, filled chocolates, individually-wrapped in red foil, can now be purchased in many countries besides Austria. 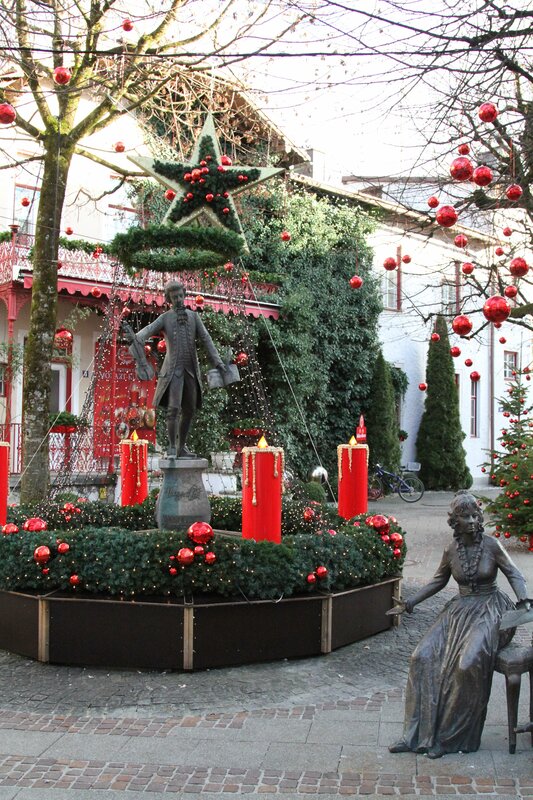 This company has created a Mozart grotto next to its main shop over the border in Bad Reichenhall, which features a statue of the composer, a fountain and bushes hung with winking red lights and huge baubles in its trademark silvery red. Today, the city’s prosperity depends very much on Mozart tourism, but it was a wealthy place long before the composer’s birth. As its name suggests, its fortune was built on salt. This, of course, resonates with me, because Salt, good fortune and creativity are very much linked in my mental map. There is a famous salt mine close by the city which offers tours to visitors. We decided not to visit, as we have recently been to a similar attraction in Kraków. The Austrian one, apparently, makes a particular attempt to please family parties: its offers include enabling children to dress up as eighteenth-century peasant salt-workers. The river that runs through the city also takes its name from salt: tolls on the salt-carrying barges created some of its wealth. Walking along the boulder-strewn riverside is a pleasing experience and there are several picturesque bridges, one of which is hung all the way along with lovers’ padlocks. 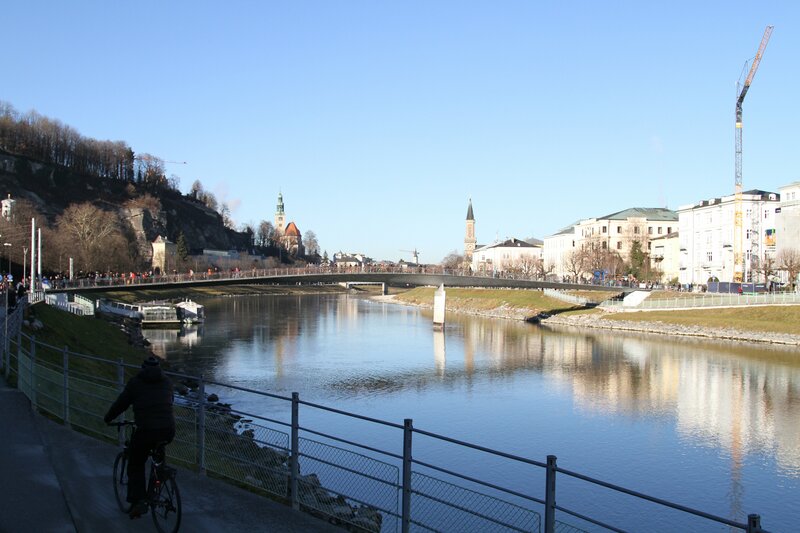 The Salzburg area has been unseasonably warm between Christmas and the New Year. There is snow here, but only high in the mountains. The local people are amazed at how mild the weather has been. Nevertheless, the people in the streets all wear hats, scarves, boots and quilted jackets or loden coats. Babies in buggies are muffled to the eyebrows. It is possible to stand in the sun and feel real warmth on your face, but as soon as you step into one of the many alleyways or just enter the shadows of the tall terraced buildings, the cold bites. There may be no snow at the moment, but you feel that it is only biding its time. February is the coldest month here: the Austrian mountain winter has really only just begun. 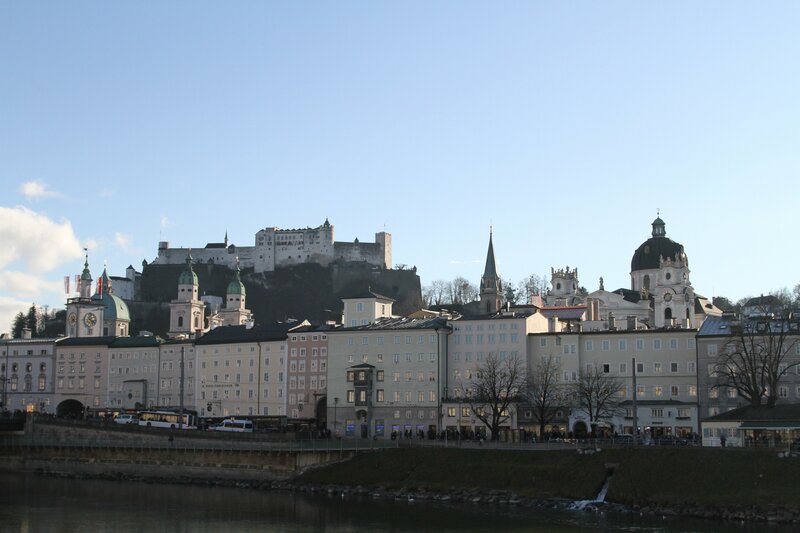 What does Salzburg have to offer in the way of inspiration for a crime fiction writer? On the face of it, this bright, industrious city, peopled with serene residents and laughing holidaymakers, does not seem a promising setting for dark deeds. However, in the alleyway marked ‘Juden Gasse’, with its stolpersteine or brass commemorative cobblestones, we stumble upon some of the darkest deeds that man has ever perpetrated upon man; and, not many kilometres away, lurks the Eagle’s Nest, mountain retreat of one of the world’s most sinister fantasists and almost the most prolific murderer of all time. Hi Christina,Happy New Year to you. You have put some lovely blogs on. Very interesting and inspirational, I do enjoy reading them. Due to ill health/insurance reasons, I can no longer fly, you are my my ‘eyes and ears’ on your travels! Thank you. As part of improving my own writing, I have joined word press, but struggling to find my way round it! I did manage to get a blog on yesterday, i feel that was an achievement. A beautiful city it is indeed, Christina and your photos give it an added sparkle. I have very fond memories of Salzburg, and it is even more meaningful for you with its creative connections 🙂 I shall now have to look up who this most prolific murderer is, but I have a feeling I might know already! Hoping you’ve had a lovely holiday there in Austria. I suppose now it’s back to work for you too. Planet: Earth. Species: A112-O87. Humans. Nasty self-destructive bipedal omnivores. Thinking of stopping by and study the natives for you dissertation? Don’t. Extremely dangerous and volatile. When they’re not busy killing off each other, killing off the likes of you becomes their favorite pastime. May also consume what they kill. Hahahaha! I’d hate to think that you were antipathetic to the entire human race, Jack, but sometimes I share William Golding’s view that savagery lurks only a sliver of skin beneath our ‘civilised’ exterior. A drive along the motorway reveals, within minutes, basic human aggression! We don’t, as a race, do ourselves any favours!